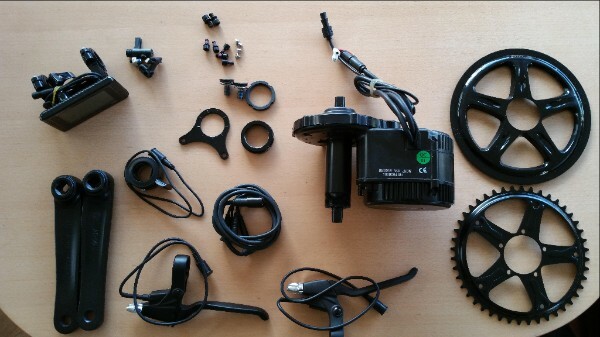 Empowering E-Bikes' primary offering is based on the Bafang BBS01 250 Watt mid drive motor system. The unit fits through the bottom bracket shell of a bike, replacing the bottom bracket with a powered axle, and so driving the bike via the chain and gears. Bafang are a a well established manufacturer of electric bike motor systems, providing both geared hub motors (used in various high end E-bike brands) and mid drive units (provided as a conversion kit). These have been previously marketing under the "8FUN" brand, but are the same systems. Three BBSxx systems are currently available, the BBS01, BBS02 (higher power) and BBSHD (most powerful). The BBS01 is a 250W system (as per the markings visible in the kit photo just left of the QC sticker on the motor unit). 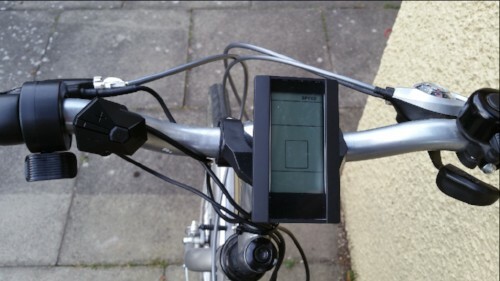 It therefore complies with the maximum power rating for a road legal electric bike in the UK. Maximum voltage and current on the BBS01 are up to 36V and 15A. The BBS02 and BBSHD (as well as the 350 Watt variant on the BBS01) are too high powered to be road legal as an electric bike in the UK. Unlike a hub motor (i.e. a motor that forms the hub of a bike wheel and provides assistance by directly turning the wheel), a mid drive unit provides assistance via the chain and transmission system, in the same way as the rider turning the pedals. This is a key benefit, as electric bikes motor efficiency is critically dependant on the speed the motor spins at. A hub motor must spin with a fixed relation to the wheel / bike speed, and can "stall" on steep hills, in exactly the same way as a bike rider would in a high gear. A mid drive motor on the other hand, assuming a sufficient gear range is available, can spin at its optimum speed and efficiency whether the bike is going slowly on a hill (low gear selected) or fast (high gear selected). Furthermore, the system has various other advantages. The exact characteristics of the system depend on the display / control unit, of which there are various options. However, the motor operates by both throttle and pedal assist modes. The throttle operates the motor directly at any time it is triggered, regardless of whether the pedals are turning; the pedal assist system operates the motor automatically whenever the pedals are turned (independently of the throttle). The kit is typically provided with a thumb throttle as standard; Empowering E-Bikes can provide the system with either the stock throttle or with a free upgraded half twist throttle which can often be more comfortable for extended use (depending on user preferences). The system can freewheel in the same way as a normal bike i.e. the wheels can turn without the pedals turning. There is also a second freewheel functions in that it is also possible to operate the motor via the throttle without the pedals turning. The display unit has levels which can be set that determine the speed of the motor (whether activated by throttle or PAS); depending on the controller, there may typically be 3,5,7 or 9 levels. These can be selected via the display unit (note that the highest level always corresponds to 100% power). Maximum speed can also be typically programmed via the control unit; by default this would be provided set to ~ 15 mph / 24 kmph, corresponding to the legal speed assist limit for the UK. Depending on the display unit chosen, USB charging for mobile phones etc may also be available. Note that depending on the control setup, different levels of power may be available via throttle and PAS i.e. full power available via the throttle with PAS providing a more limited level. The PAS operation therefore provides a continuous but moderate / efficient assistance for general travel, with the throttle being deployed to provide high power whenever necessary (i.e. primarily on hills). Many bike types are suitable for conversion. Specific design considerations are as follows, however broadly speaking most mountain and hybrid types are likely to be suitable; drop handlebars and narrow wheels (i.e. racing bikes) are less likely to be suitable. Empowering E-Bikes can provide a no obligation assessment for a specific bike, based on the considerations below. 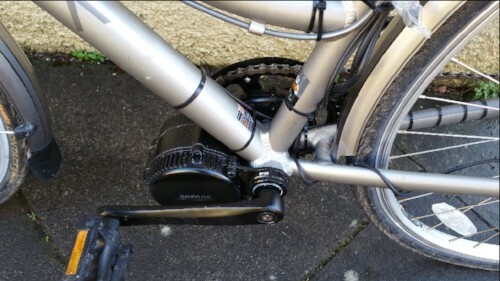 The mid drive unit replaces the bike bottom bracket and chain wheels, as illustrated. The integrated drive shaft fits through the bottom bracket shell in the same way as a bottom bracket unit, and bolts in place. The motor unit itself sits under the frame and in front of the bottom bracket shell. The motor unit connects to the battery and to the other components via a water resistant wiring harness. These include a speed sensor (generally located on the rear wheel) and control components that are fitted to the handlebars: electric cut out brake levers, throttle, on/off switch and display unit. The mid drive unit replaces the front chain rings with a single ring that attaches to the motor unit and may therefore impact the gear range of the bike. The default for the BBS01 is a 44T chain ring. Adaptors are available to allow smaller chain rings to be attached, although use of these is dependent on the chain line. The unit is designed to fit standard 68mm wide bottom brackets, although it is possible to fit onto 73mm brackets (albeit with slightly less thread to hold the unit in place. The diameter of the drive shaft that fits into the bottom bracket shell is 33.5mm, as per a standard bottom bracket. In most cases, the drive unit will slide easily into the bottom bracket shell of a typical bike frame. However, in some cases it may be necessary to use a Dremel or similar rotary grinding tool to remove any burrs or even a small amount of metal from the internal surface. Likewise if there are elements protruding at either end of the bottom bracket then these may need to be smoothed off. It is also possible for the motor housing to need to be located further out to one side, especially on bikes designed to take wide rear wheels. It should also be noted that there is a limited gap (~13mm) between the drive shaft that fits inside the bottom bracket shell and the main motor unit that sits outside it below the frame. For most standard frames, this means that there is just enough space for cable housing or cables run flush with the frame to pass between the underside of the bottom bracket shell and the motor. However, where cables are run under the bottom bracket shell and are mounted on / in a raised housing, it may be necessary to alter or reroute these. Finally, various elements are mounted on the handlebars. Electric bike brake levers (that cut out the motor as well as operating the brakes) replace the existing brake levers. The throttle, on/off switch and display unit all mount simply to the handlebars. Consideration also needs to be given to the handlebar setup. Addition of a motor system adds various components, and while this should not cause any specific issues, it is worth planning the layout to ensure sufficient space and effective operation of all components as per the example below, showing the kit installed along with space for a front light and bell.